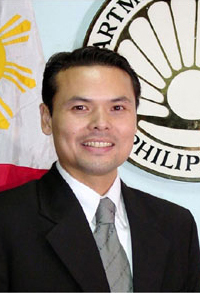 Ace Durano is the Philippines' latest Secretary of Tourism and one of the youngest and most dynamic members of the Government. Durano carries his own name appropriately, particularly the "Ace"part. Filipinos love nicknames and the country is dotted with Bings and Gings, and Ace is no exception to the rule. He has been instrumental in putting the Philippines back on the map and increasing inbound tourism. He believes his goal of five million is achievable by 2010. In an exclusive interview with Washington Times, Secretary Durano was able to get his perspective on the new strategies he is implementing. Question: Having had the opportunity to visit the Philippines as a tourist as well as on business, I've been able to witness the splendid beaches in Cebu and the historical sights of Luzon and Manila. There is much more to the Philippines than meets the eye. Your country is often misrepresented overseas as being dangerous or lacking infrastructure. How are you addressing those issues and specifically how will you communicate this to people in the United States and Europe? Secretary Durano: The challenge is quite different from market to market. Clearly there are markets more challenging than others. Seventy percent of our total foreign arrivals come from North Asia, HK, Korea and China. Asean is growing healthily as well. For this 70 percent of the market, the perception problems do not exist. For example, Japan, which is probably the most conservative and sophisticated among the North Asian Markets—their apprehension is more general than specific. If you look at outbound travel in Japan, it went down six percent this year, and Hawaii was the hardest hit. As far as Japan is concerned, they compose about 12 percent of our arrivals. They are not one of our growth markets. Our growth markets would be Korea, Mainland China and the Asean nations. The U.S. and some of the more developed European markets are where the perception problem arises. There is no easy formula to reverse the perception problem; you just consistently have to send the right messages. Our approach is a very practical one in these markets. For example Russia is one of our fastest growing markets. Arrivals grew by 30 percent. As far as North America is concerned, we will continue to focus on Philippine-Americans. In summing up, to grow the demand for tourism traffic, our market strategy concentrates resources in North Asia, emerging markets in Europe, and the Philippine-American community in the United States. This strategy has paid off and allowed us to grow our tourism traffic overall in the last four years, since 2004. On top of that, it is quite apparent investments have become interested in the sector. In fact in the past two years, the FDI (Foreign Direct Investment) in the tourism sector went into hotels and resorts. The government has followed suit by putting in the necessary infrastructure, such as airports in the destinations, etc. The overall picture is positive. In 2004 we only had 2 million tourist arrivals. Last year we had 3.1 million. This will be a growth sector for the next 40 years and we are well on the way to meet the target of 5 million visitors by 2010. Q: What is the Philippines doing to attract more MICE (Meeting, Incentive, Convention & Exhibition) business? Secretary Durano: The proximity factor plays a large role in the recent increase that the Philippines has experienced with respect to meetings and conventions. Effectively the geographical location of the Philippines places it within two hours of flying time from some of the world’s largest markets, notably Korea and Mainland China. These are the two fastest-growing outbound markets. Destinations all over the world are fighting for the same markets. Again our advantage lies in the fact that we are the closest tropical destination to these two giant marketplaces. New facilities have also contributed to growth in the MICE business. Two important venues have come on stream—the SMX (the new S & M exhibition center in Manila) as well as The Marquis, a new facility in the Shangri-La Hotel in Cebu. Mainland China is evolving so fast; for example, Hyundai China held their first dealership meeting in Asia, in the Philippines. Previously they had held meetings as far afield as Las Vegas or Gold Coast Australia. For the meetings and convention business, Korea is a big market for us. Q: Medical Tourism is an area that many countries including the Philippines are interested in. Given the high level of education, coupled with the high level of English, the Philippines is an ideal destination for MT. Is DOT involved in this new and lucrative market? Secretary Durano: We are very much involved in it. Although from the regulations side, the Department of Health manages that aspect. From the tourism point of view, we are opening up various markets. The positive development is that since two years ago, major hospitals have begun to invest in medical tourism. In the past it was just smaller clinics; now the major hospitals have joined the program. One of the sectors we are seeking to promote is in cancer treatment. This is one of those areas that the hospitals decided to focus on with respect to their international promotions. It will improve our presence in this area, as next year we won the bid to host The World Health Tourism Congress, and it will be the first in Asia. Q: Is the Philippines trying to attract the American market or just the Filipino- American market with respect to medical tourism? Secretary Durano: The medical tourism program follows the same market strategy that we do for leisure tourism, which makes sense for us, because these markets are more comfortable if they are already aware of the country. Our awareness level is respectable in the Asian market. As capacity expands, it will be natural for us to broaden our market base, but at present we are sticking to the countries closest to us. Q: One of the Philippines’ best resources is its people. They are among the most friendly and natural in the world, clearly an asset for tourism-related jobs. Are there plans afoot to do more in terms of education in bringing up the standard even more, in tourism- related jobs, i.e., hotels, airlines etc.? Secretary Durano: One of the challenges of the educational system is to provide more vocational skills to our graduates. Our goal is to make HRM graduates immediately employable—not needing further training from hotels and resorts—and to do that, we have to provide the graduates with skills to match the needs of the hotels and resorts. Language skills in Mandarin and Russian are also important. We are working closely with the universities to achieve this. The other challenge for the country is that there is a high demand for Filipino talent abroad. Just between Singapore and Macao alone, they are hiring left and right, and we have to make sure the country is producing enough, not just for the Philippines, but for the region as a whole. I am very confident that as our own sector continues to grow, the people will find the same opportunities in the Philippines as they find abroad. Q: Please feel free to address a brief message to our readers in Washington DC. Secretary Durano: I keep on saying the best is yet to come. We have got rid of a lot of our baggage from the past twenty years. Now this generation, my generation, is ready to move on. We don’t have the same political baggage of our predecessors. Its time for the Philippines to shine!